What is a Feature Package and How Does It Affect My ENA SmartVoice User Portal? Your ENA SmartVoice User Portal is a web-based interface you may access at any time to both customize your phone setup to best meet your needs, as well as manage calls and voicemails. The available settings in the Reach Me function. The available options for programming unused keys. In this guide, if a feature is only available in specific feature packages, we will note that. Note: If you have an extension-only number, your full 10-digit number will be a customer prefix followed by your extension. If you do not know your customer prefix, check with your system administrator. Note: Your system administrator will provide you with your default User Portal password. 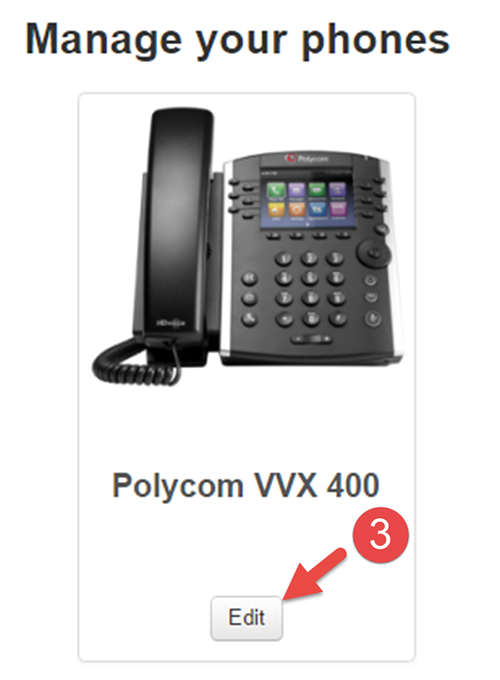 Your User Portal Password is not related in any way to your Voicemail PIN. Click change for Account Password. Enter new password and enter again to validate. 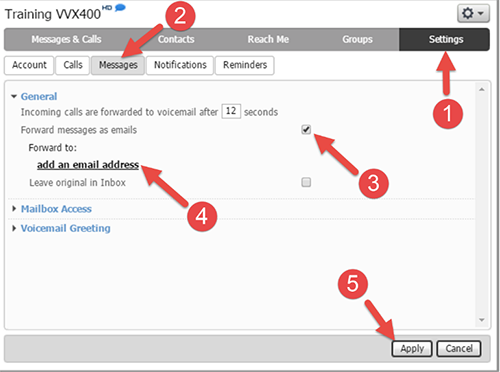 You can check and manage your voicemail online under the Messages and Calls tab. Press the play button to listen to a message. Click the X to delete a message. To record a Reply using your computer microphone. Mark as Heard, which removes the message from your New Messages and leaves it in your voicemail box. Forward as Email to send the .wav file of the voicemail to a recipient’s email. Forward as Voicemail to another ENA SmartVoice phone in your system. Enter the number of seconds you would like your phone to ring before it goes to voicemail. Click Forward messages as emails. Click add an email address. Enter the email address to which you would like voicemails to be forwarded. 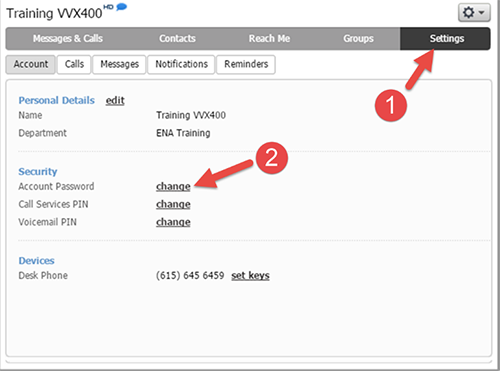 Click Reach Me to set up call forwarding from you ENA SmartVoice extension to another number. 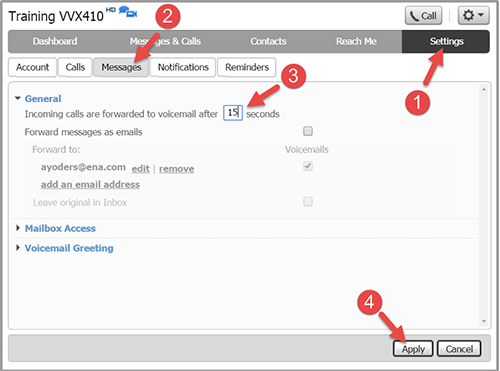 Note: The Reach Me set up options vary by ENA SmartVoice feature package. You can program unused keys on your phone as shortcuts for the call sequences you use most often. Directed Pickup All except Prime When target phone number receives an incoming call, able to press key to answer. Target phone number must be an ENA SmartVoice extension. (The ability to use an EME as a call pick up button is not available with Prime. Shows when the target ENA SmartVoice extension is in use. Speed dial to monitored extension. One-touch blind transfer to monitored extension. Call pickup of monitored extension (not available in Prime). Limit to 4 per phone with Prime and Essential feature packages. The extension being monitored must be a part of your ENA SmartVoice system. An Enhanced Monitored Extension key does not work as a speed dial key during a Consultative transfer. One touch call park on the Call Park Orbit you specify when configuring the key. Provides onscreen indicator of whether or not call has been retrieved. Group Pickup All except Prime When any member of call group receives an incoming call, able to press Group Pickup key to answer. Your ENA SmartVoice System Administrator creates and manages call groups. Line All Line from which calls may be placed and on which calls may be received. Line 1 on a phone is almost always the extension for that phone. Additional lines (e.g., Main) may be added (forked) to a phone. Your ENA SmartVoice System Administrator may add or remove lines from your phone. Park Call All One touch call park to the first available Call Park Orbit. They system will notify you of the orbit on which the call is parked. If you receive an error message of "No call park orbits available," please check with your ENA SmartVoice System Administrator to have them activated. Retrieve Parked Call (Specified Orbit) All Retrieves a call parked on the Call Park Orbit you specify when you configure the key. Dials out to the number you specify in the Number field. Speed dial numbers may be internal or external. The speed dial key may be used in conjunction with the transfer key to complete a blind or consultative transfer. One Touch Transfer All One touch blind transfer to target number. 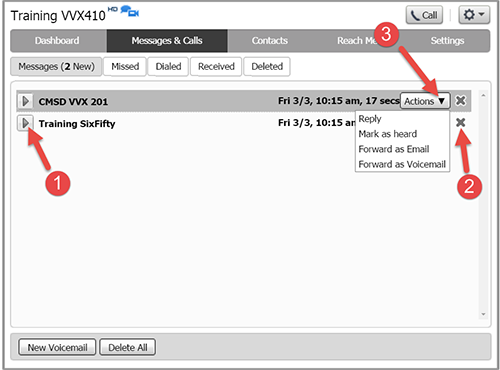 Voicemail All Performs the same function as the Voicemail soft key or button. Conference All Performs the same function as the Conference soft key available during an active call. Directory All Provides access to your phone's Directory both when you are on a call and when the phone is idle. DND All Performs the same function as the DND soft key. Forward All Toggles call forwarding to the number specified in the Number field on and off. When call forwarding is on, see a yellow arrow at top of screen. When call forwarding is on, press key again to stop forwarding. Can be used as Day/Night key to forward calls to Premium Attendant. Group Listening All Activates the Speakerphone and Handset/Headset mode at the same time. Enables you to to speak and listen through the handset/headset, while the others nearby can only listen through the speaker. Hold All Place an active call on hold or retrieve a held call. 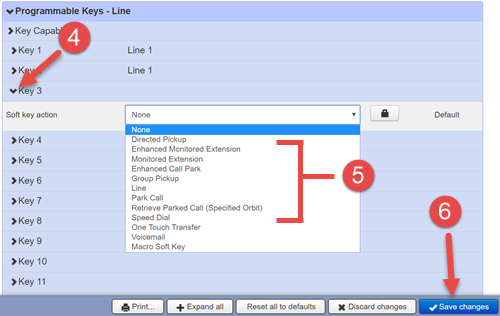 Places intercom call to extension specified in Number field. If do not specify a number, may press key and enter number in your ENA SmartVoice system to which you would like to place an intercom call. Multicast Paging All Broadcasts a page to a single paging group (e.g., All Call) you specify in the Port field. Your ENA SmartVoice System Administrator creates and manages paging groups. Paging List All Brings up a list of paging groups to which you can broadcast from your phone. Private Call Hold All A call placed on Private Call Hold may only be retrieved from your phone, even if it is on a shared line. Retrieve Parked Call All Retrieves a call parked on the Call Park Orbit you specify when you configure the key. Transfer All One touch blind transfer to target number. Note: It is important to configure phone keys through either the ENA SmartVoice Administrator or User portal. While it is possible to configure keys locally on a Yealink phone, keys configured locally through the phone will be erased if a configuration update is made. In addition, keys configured through the phone are not visible to the ENA CTAC. 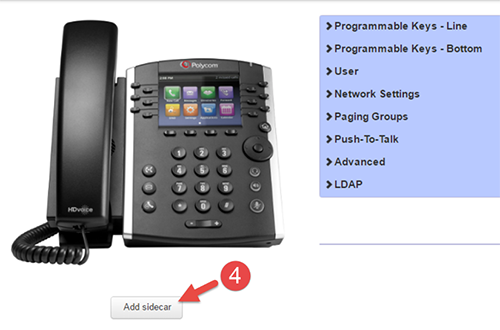 Note: This video shows programming unused keys on the Polycom VVX 300 and 400 Series phones, however, the steps for programming unused keys in the ENA SmartVoice User Portal is the same for all phone models. The difference is the number and placement of available keys. Click >to open the menu for key want to program and select desired option from drop down menu. 5. Add the required information to the fields. Once you have added an Expansion Module (Sidecar) to your phone, you follow the same steps you use to program keys on your phone and have the same options. 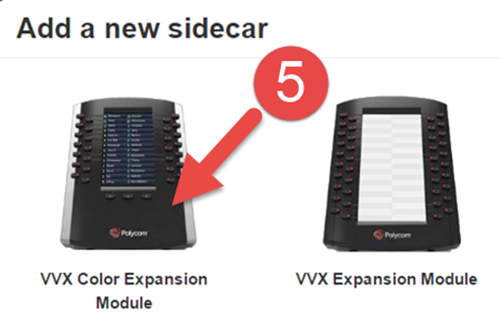 If do not see Sidecar, click Add Sidecar. 7. Add the required information to the fields. Your phone configuration is updated every evening, so if you do not manually update your phone’s configuration, you will see the new settings the next day. Press the Home button or Menu key.